This example is for the design of a reinforced concrete flat slab without column heads. 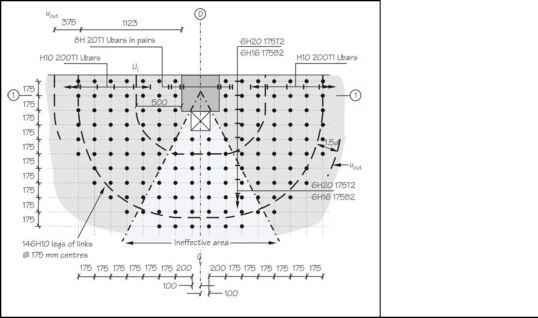 The slab is part of a larger floor plate and is taken from Guide to the design and construction of reinforced concrete flat slabs[29\ where finite element analysis and design to Eurocode 2 is illustrated. 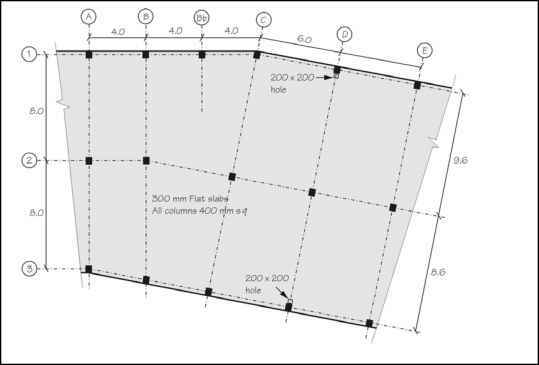 As with the Guide, grid line C will be designed but, for the sake of illustration, coefficients will be used to establish design moments and shears in this critical area of the slab. The slab is for an office where the specified load is 1.0 kN / m2 for finishes and 4.0 kN / m2 imposed (no partitions). Perimeter load is assumed to be 10 kN / m. Concrete is C30 / 37. The slab is 300 mm thick and columns are 400 mm square and extend 4.5 m above and below. A 2 hour fire rating is required.